Are Books Doomed to Become Art Collector Items? The always fascinating Dark Roasted Blend has an article on alternative uses for books. 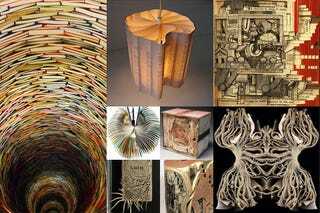 Sculptures, lamps, structures, furniture... everything made with books. It's an eerie view on book heaven or book hell, depending on your mood. Mine is a bit gloomy, so looking at the beautifully spooky gallery and knowing about the renassaince of electronic books, I can't help but wonder: Do these images represent the beginning of the end for books as we know them?